Yeah, but: Like Opus said, "Well maybe not THAT bad, but Lord, it wasn't good." 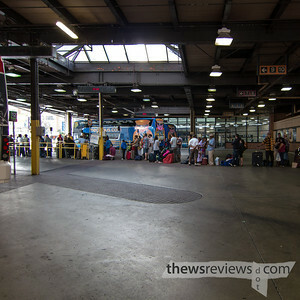 The Long Version: The Toronto Coach Terminal, which is home to Greyhound, Megabus, and Ontario Northland, among other bus lines, is an excellent example of how not to do things. First, the good points: Inside the main doors is a large ticketing area, as well as a traveller's information kiosk that's occasionally staffed by (presumably) friendly, patient, and helpful people. There's a considerable amount of seating, which is eclectically arranged and cosy, even though much of it is roped off as an 'express' area. There are information screens that show which platform each bus will be departing from, and there are even storage lockers available, which is quite a luxury these days. And that concludes the summation of the good points of Toronto's Bay Street bus terminal. It's not glamorous, but restrooms are one of the most important consideration for travellers. These are absurdly small and in terrible repair – if there was any doubt that this building is owned and run by the TTC, this will remove it. Accommodating four people will make the Men's uncomfortably crowded, and the Women's is rumoured to be worse. For bonus points they're in the basement, far away and out of sight of the bus platforms. The up and down escalators are in different places, so you don't return to where you started, and neither one is convenient to the bus loading platforms. I'm trying to imagine a worse implementation of such a fundamental amenity, and keep coming up blank. Also downstairs is a small convenience store selling touristy things and a poolhall to help pass the time. There are no food-equipped vending machines in the building, though, so when those are closed it's time to explore the neighbourhood. 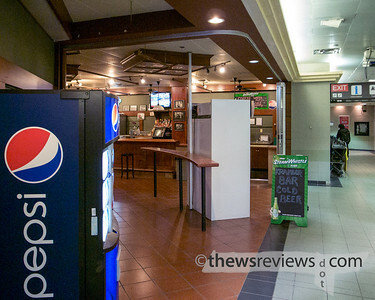 The basement does have a pedestrian passageway to the Atrium On Bay shopping complex, which mostly keeps office hours, but has a food court with much better washrooms and a McDonalds. That seems to be the best we can offer visitors with two kids, three suitcases, and half an hour left before they need to go stand outside in a garage. Yes, dear reader, the best is yet to come. The bus platforms don't deserve the term. Civilized bus stations have indoor waiting areas with seats and heat, and the people walk up to the bus when it's ready for them. Toronto does it backwards. People here are expected to line up – at least half an hour early, because buying a ticket doesn't guarantee a seat – and stand waiting in an outdoor garage. 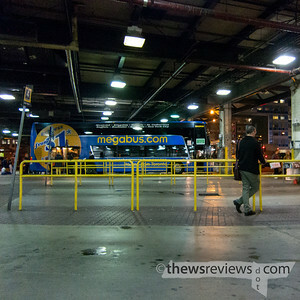 Metal railings mark the places for the queues, but a bus that can hold fifty or eighty people can create quite the line. Did I mention that this is in Toronto? There is a roof that keeps most of the rain and snow out, but our weather is lousy for most of the year, being either too hot or too cold. And even on a pleasant day, spending it standing squished between buses with their engines running is nobody's idea of fun. When a bus wants to reach the loading area it needs to drive through the lines of queueing people, who now need to shuffle themselves and their luggage out of the way. Did I mention that these massive vehicles need to turn to reach the correct positions, often with just a few feet of clearance? I can't imagine the stress this must put on long-distance drivers as they try to navigate a moving obstacle course of tired people pulling toddlers and wheeled suitcases. And the crowning glory of the whole endeavour is just how busy the whole thing is. I've been waiting at a platform for the suggested half-hour prior to departure only to have two other buses depart from the same platform in that time. This leaves the bus drivers walking up and down the line calling out their destination. "Peterborough? Peterborough? Niagara Falls? Owen Sound?" I think the term I'm looking for is 'cluster farce', but I could be mixing up two expressions. 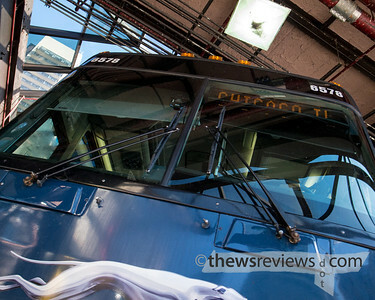 And once the bus is ready to go the experience still isn't quite over. The buses get to pull out onto a nice and wide public roadway, but it's also used for bus parking, which narrows it considerably. Having your bus need to do a three-point-turn is just the crowning touch on a congested and absurd experience. This station needs to be torn down. It can't handle the passenger volume, which is increasing, but its replacement hasn't been a priority for the city planners. GO Transit has a more sensibly designed station farther south to serve its regional buses, but there's no way to add on significantly more service there, and the main inter-city bus station really needs to be in the city's core. The fact is that a city will make the room, and find the money, for the things that it wants. 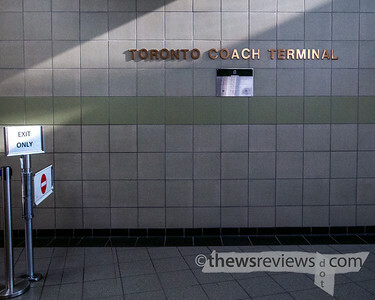 Improving the TTC-owned Toronto Coach Terminal just doesn't rank highly enough to happen. The commercial district that houses the existing bus station has had massive redevelopment over the past decade, including a huge parking and shopping complex on an ideally-located prime intersection. It should have been an automatic choice for a transportation hub, but even with that opportunity missed, other block-scale development projects are not hard to find. I can only hope that our next mayor can see beyond the suburbs.